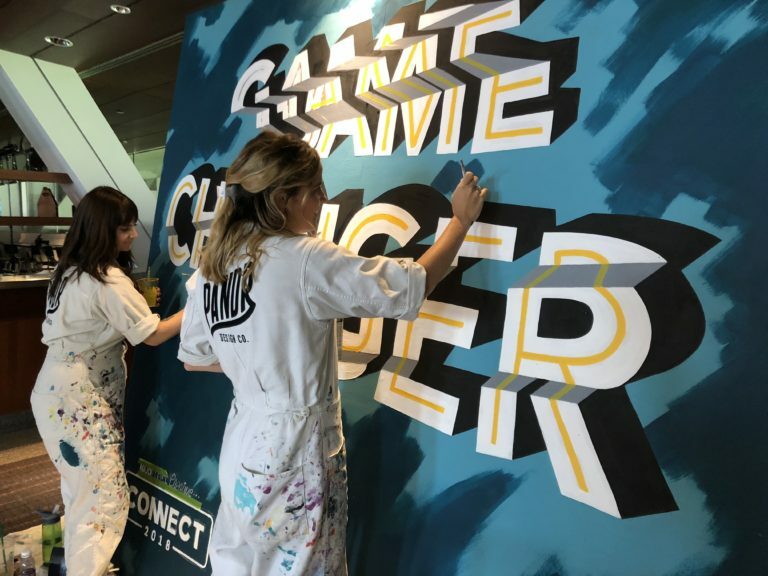 Mural and Speaking – Major Level Creative Connect 2018 — Pandr Design Co.
How do you talk to an audience of over 300 major level creatives about the power of engagement? Easy. Imagine everyone in their underwear. Just kidding, you do exactly what we did. Initially, we jet from San Diego to Chicago, Illinois. Meeting up with the professional creatives in the Major Level sports industry was an honor. Meeting the design geniuses behind the professional sports industry was eye opening and inspiring. Furthermore, we got to experience the ins-and-outs of the industry as a creative. The 8’x8′ mural we painted during the conference was a great way to get in front of the crowd and show what we do. Certainly, there weren’t a lot of muralists in attendence so it was great to converse with people of different skills and attributes. The 8′ x 8′ mural was done on wooden panel. As a free standing structure in the center of the conference, we had a great time in the process. While the rest of the conference was popping with sessions and workshops, our process was a great entertainment piece for those moments in between. Once the mural was complete, we had the opportunity to own the floor. We spoke about what it means to be a creative entrepreneur, and the power of engagement. We love the chances we get to paint, and then talk about it afterwards. In addition to painting the mural for the attendees, we love being able to engage the crowd with the knowledge we have to offer.